The Currently sharing tab and yellow border around the shared content appears. 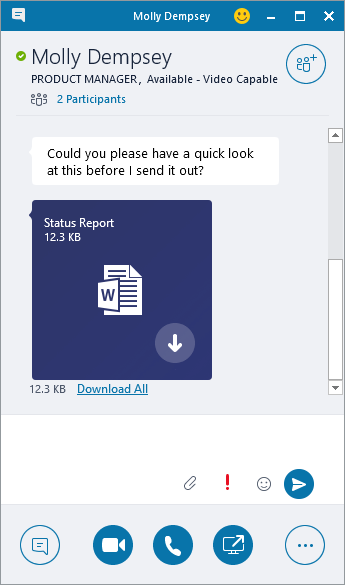 Copy the file or image you want to send, and paste it into the conversation window. Everyone in the conversation receives a notification, which they can accept or decline. Select the contacts from your contacts list. The selected contacts receive a notification, which they can accept or decline. Select the status arrow below your name. Select the presence indicator you want to display. To undo, or have Skype for Business automatically update your status, select Reset Status. 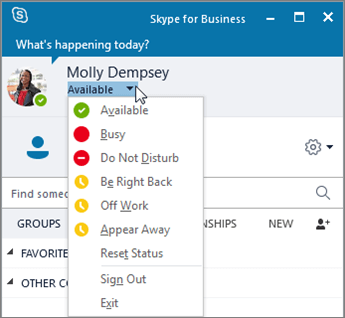 For more information, see Change your presence status in Skype for Business. Select the Meetings icon in the Skype for Business window, and then double-click the meeting to join. 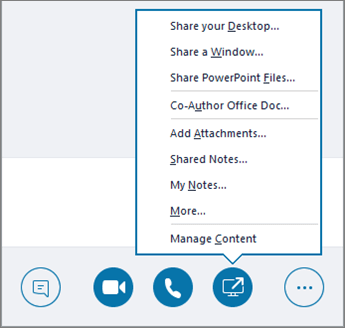 Select Join Skype Meeting in an Outlook meeting request. Select Join Online in an Outlook meeting reminder. Select Home > New Skype Meeting. Tip: Before you send the meeting request, set options, like who can get into the meeting directly, and who has to wait in the virtual lobby. 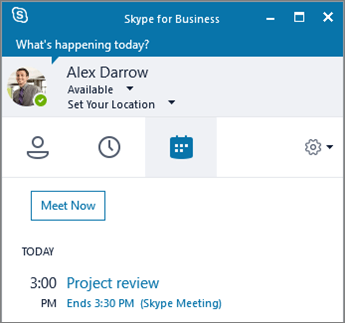 For more, see Set up a Skype for Business Meeting in Outlook.